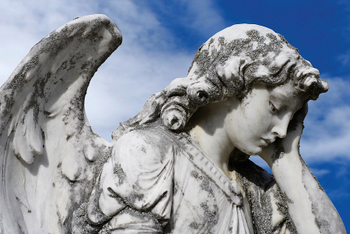 I find these sad angel pictures poignant and moving. But are there really sad angels? Do angels cry? What could cause an angel to feel despair? I don’t have a definite answer to these questions. I believe that angels are filled with the joy of God, but I also think that angels feel sad when we are sad. After all, they are beings of deep compassion and kindness. By the way, artists have been inspired by these questions. 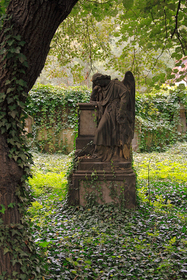 You will find an array of statues and paintings depicting crying angels. 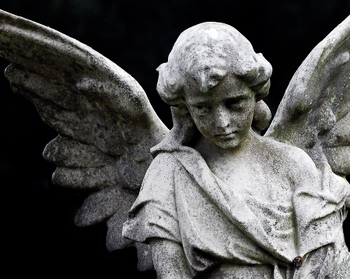 You will also come across poems and stories about weeping angels. The desire of power in excess caused angels to fall.The desire of knowledge in excess caused man to fall. But in love and charity there is no excess, neither can man or angels come into danger by it. A man on the street is pointing up to the sky. 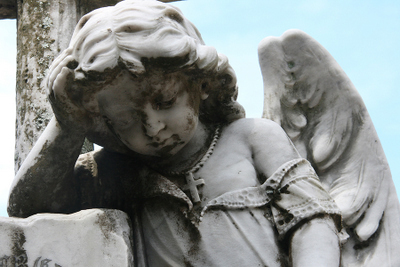 Pictures of sad angels make me think about the infinite love of God and the angels. They remind me to be grateful and to know that I am not alone in my suffering.